Welcome to our Eco-School web page. THE PADIHAM PRIMARY SCHOOL ECO CODE. E veryone helps to look after our world. O nly drive to school when necessary. O nly use what we need. L ook after our woods. During the hot weather we have made sure the plants in our allotment area are well watered. Have a look in our Garden area to meet some new members of our school community. Each class was challenged to make a scarecrow of a story character to scare the birds away from our plants. Look at the photos. Can you guess who we made? Thank you to all the children in Year 5 and 6 who spent a cold afternoon collecting the litter from around our school grounds. The woods now look much better again. The first week of the Spring term saw all the children taking part in environmental education activities during our Eco Week. The staff from Global Renewables started us off by presenting an informative assembly about reducing and re-using rubbish. The School Council ran a competition to challenge the children to make something useful from a piece of 'rubbish'. There were some great entries, with ideas such as bird feeders and sock puppets. Well done to Ella and Connor who won the prizes. Work will continue next week with Year's 5 and 6 visiting Global Renewables to see how household rubbish is processed, and some children will also be involved in the RSPB School's Bird Watch. Hopefully there will now be less dripping taps in your bathrooms, and lights left on in bedrooms. At the end of term we dug up the potatoes we planted. It was really fun to see how many had grown. We also dug up a couple of delicious looking beetroot. We gave everything a really good water before the long summer holidays, and made sure our worms were happy too. In the infants we have been learning about animal habitats and writing poetry about minibeasts. We have built a log pile to encourage creatures to live happily in our school grounds. We have planted a variety of herbs and flower seeds. We noticed seeds come in lots of shapes and sizes. The Eco-Science club have begun their spring planting now the weather has improved. We have planted beetroot, potatoes, cabbage and a variety ofcarrot in one ofthe planters. We can already see green shoots emerging from the soil. Thank you to everyone who contributed to our 'Phil the Bag' textile collection. As you can see from the photos we had a great response. We collected 400kg of textiles, making us the grand total of £200 for school funds. We have also recycled and prevented the textiles from going to landfill. The Eco-science club have been busy planting containers full of tulips and daffodils to make our school look pretty, and to attract wildlife. We have also planted 30 new plants by the shed to form a hedgerow. Worms, worms....... and more worms! The Eco-Science Club would like to introduce you to our latest eco-warriors.... 2000 lovely, friendly, hard-working worms. We now have two wormeries where our wiggly friends will live. Each week we will put some of our school composting materials into the wormeries and the worms will help to turn it into fertilizer for our school grown plants and vegetables this spring. We tried to think of names for them all, but ran out of ideas quite quickly! We have new Eco-Warriors in school. Our Eco-Science Club members meet every Tuesday after school with Mrs Breaks and Mrs Barford. Our aim is to have fun caring for our school grounds and looking after the local wildlife. At our first meeting we planted containers of bulbs, which will make the front of our school look lovely in Spring. We have dug up the potatoes that the School Councillors planted in Spring. The ladies in the school kitchen kindly cooked them for the children in Mrs Barford's class to enjoy. The children said they were "Delicious". Great news! Our 'Phil the Bag' clothes collection during Green Week has raised the super total of £303.50 for our school. Well done and thank you to everyone who donated their unwanted textiles to school. The money will be spent on new eco resources. More news about future collections soon! We have chosen to spend some of this money on more composting equipment for school. We have bought 2 more huge composters for our fruit and garden waste, and two wormeries which will help us to make our own natural fertilizer. We will also use some of the money to buy seeds so we can grow more vegetables this year. Years 5 and 6 travelled to Global Renewables in Leyland. This is the recycling unit where all the rubbish from our homes in Lancashire is taken each day to be sorted. It was a really interesting trip. We were shown the process our rubbish takes from the bin wagon to finally being turned into compost, recycling and landfill. We were all surprised how much rubbish is made in Lancashire each day. We saw really clever machines which sort our rubbish using magnets, light and wind. We were shocked how much of the rubbish consisted of plastic bags which should be reused. We were challenged to bring a 'Zero Waste' packed lunch with us. 6D and 5/6B managed no waste at all, and 5W only made a really small amount. We played games which reinforced the need to care for the environment. We also carried out sorting activities which taught us about material properties. Thank you to the staff who showed us round and taught us so much. 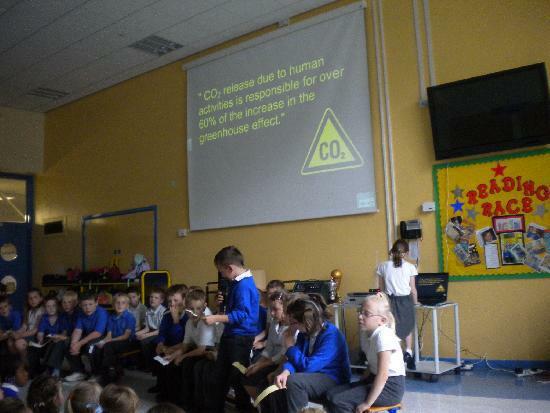 We held our Padiham Primary 'Green Week' on the 10th to 14th June. During the week all the children took part in activities related to Environmental issues. To help the environment we were encouraged to walk to school. Well done to the class with the most walkers during the week - 5W. Tuesday was 'Power Saving Day'. We turned off as much electrical equipment as possible, including the computers and the lights. We monitored how much electricity we saved. We were visited by Phil from Global Renewables at Leyland. He showed us how we can REDUCE, RE-USE and RECYCLE to help to reduce the waste we put in our bins that will go to landfill. Years 5 and 6 are to visit the recycle centre next week. The upper juniors focused on the Rainforests, while the lower juniors made beautiful minature gardens. The infants had fun making items such as recycled musical instruments and sock puppets. We are going to have an exhibition of the items were have created during the week. On Thursday we had a 'Phil the Bag' textile collection. We collected 152 bags, which will be recycled in various ways, and also help to raise funds for school. To conclude our special week we held a Trashion show on Friday. Children had made spectacular outfits from recycled materials, and we loved singing along to the music. Well done to all the children, who had super ideas, and really showed they cared about our amazing planet. During ‘Green Week’ class 3/4R was fortunate enough to be visited by Denise Westall Tesco’s Community Champion. Denise came into school and spoke to 3/4R about the importance of recycling and how Tescos in Padiham is an Eco store! To help the children on their course to being more Eco friendly Denise kindly gave all the children 3/4R a bag for life which was designed by our own pupil Libby Blezard in 5W! Our Eco-Warrior team have carried out a new environmental review of our school, so we can decide which of the nine Eco-Schools topics we should concentrate on this term. We were pleased with our findings, and have identified 'Global Perspectives' as our area for development. We raised lots of money for Children in Need by bringing our unwanted books into school for other children to take home and enjoy. This was an excellent way to RECYCLE, and have fun reading. At Padiham Primary School rainwater is collected in large tanks and stored. This recycled water is then used to flush the toilets. We are keeping a weekly record of how much recycled water we use in this way. Would you believe on average we use over 8000 litres of water each week just in flushing toilets!!! It's a good job it rains a lot in Padiham. Well done to all the children and parents who made a special effort to walk to school during our 'WALK TO SCHOOL WEEK' in July. Keep up the good work. Thank you to 5/6B and the School Councillors who spent an afternoon litter picking in the woods by our school. We found lots of rubbish, including things such as drinks bottles, sweet wrappers, crisp packets, newspapers and black bags full of household rubbish! The woods now look fantastic again - just in time for Spring. Please help us to keep it this way by putting your rubbish in the bins provided. We have built a bigger and better Bug Hotel in the wildlife area behind the stone circle. It's amazing what you can do with recycled materials. We are hoping lots of insects will want to live there. We helped to celebrate the Queen's Diamond Jubilee by planting lots of trees and bushes in the school grounds. They will also attract wildlife and help us on our Eco-journey. We have built bird boxes this term to encourage wild birds to nest in our school grounds this Spring. A big thank you to Graham & Brown, who have donated surplus rolls of wallpaper and canvasses to school. We are recycling them into some super artwork which you will see around school. 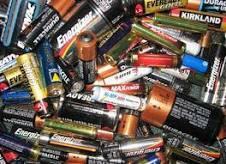 We are collecting used batteries in school which are going to be recycled safely. Help us save the planet, and hopefully win a prize from Lancashire County Council. Bring your old batteries into school and put them in the special box by the Eco-Schools display. In March we planted some vegetables. We have been watching them grow. Look at our delicious potatoes. We are going to cook them next week. We all agreed that our lettuce tasted really good. We used it to make a fresh salad. The carrots are growing well, but are a bit small to eat yet. 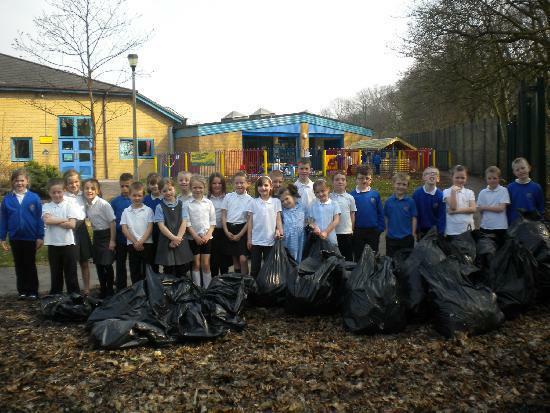 The children in Year's 3, 4 and 6 have done a wonderful job collecting the litter from around the school grounds. Well done everybody. The woods look fantastic, and there is now room for the spring daffodils to grow. Among the rubbish found was a lamp shade, a pair of boots, an umbrella, a pair of tights, and many plastic drinks bottles. 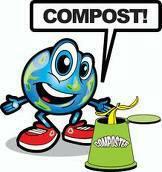 We are now composting our fruit waste every day. This will reduce the amount of rubbish the infants produce each week. After a while we will be able to use the compost in our garden planters. The school council have been busy. 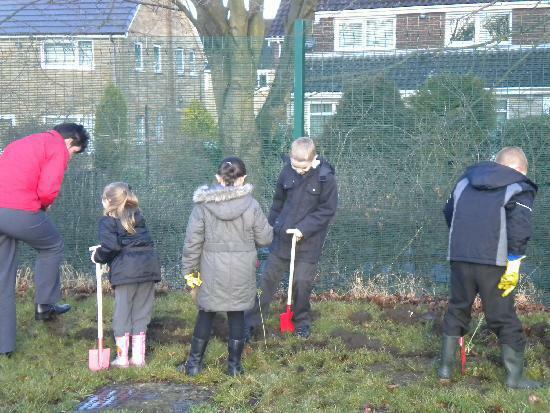 Plants were donated to our school by Sainsbury's and we have planted a hedgerow near the garden planters. Muddy work! The School Council are delighted to announce that in July 2010, Padiham Primary School achieved the Eco-Schools Silver Award. This is due to our efforts in making our school grounds more attractive to wildlife. Well done to all those involved. Thankyou to the Year 3 children who presented an assembly to the whole school about how to help protect our planet. It is good to know that our school is already great at saving water, and is working hard to recycle. Our area of development continues to be 'Bio-diversity', and we are encouraging more plants and animals to live in our school grounds. We are taking part in a nationwide project to develop 10,000 new gardens this year called The Big Wildlife Garden. We have achieved enough points for our Wildlife Garden Silver Award. We have made a BUG HOTEL in our school playground, and are keeping a close eye on it to see who comes to stay. We have two new planters where we have planted pumpkin seeds which we hope will be ready in the autumn. There are also some flower seeds to attract insects. 6D have filled the bird tables with foods that will attract wild birds to our playground. Our wild garden areas are full of beautiful poppies and cornflowers and we have seen lots of bees visiting. FANTASTIC DESIGNS! Well done to Grace, Daniel and Adam who won the School Council litter poster competition. Lets hope your posters help to remind everyone to keep our school grounds tidy. Well done 6D and 5/6B. You have done a fantastic job at clearing all the rubbish and litter that people have left in our woods and school grounds. Your work helped us to achieve our first Eco-School award in February 2010. 36 bags of rubbish were collected by our children during the litter pick!. The Eco-Schools programme is the largest sustainable schools programme in the world. Currently, the Programme is running in 43 countries around the world, involving 27,000 schools, 6,000,000 students, 400,000 teachers and 4,000 local authorities. Keep Britain Tidy run Eco-Schools in England, there are currently over 12,100 schools registered, over 55% of schools in England! We have enrolled and the School Council are co-ordinating our progress through the 9 topics. The overall aim of the project is to work together to make our schools 'Greener'. REMEMBER- LITTER GOES IN YOUR POCKET OR THE BIN, NOT WHERE WILDLIFE AND CHILDREN CAN BE HURT BY IT.